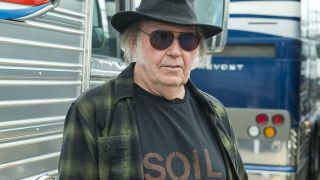 Neil Young has revealed he’s back in the studio with Crazy Horse to work on their first album together since 2012’s Psychedelic Pill. Young reports on his Archives website that the as-yet-untitled record will be released at some point year and that 11 songs are written - with recording taking place this week. Young says: “The band is excited to make this new album and continue our story. We sincerely hope you enjoy our new music when it’s released this year because we know we will enjoy making it. Young will take to the stage at the British Summer Time Festival at London’s Hyde Park on July 19 with Bob Dylan. However, his performance will go proceed without Barclays as a sponsor. Young and Dylan will also perform at Nolan Park, Kilkenny, on July 14.